This week, here in not-so-sunny Cornwall, the weather has been hideous. It’s hardly stopped raining. In fact, it’s hardly stopped raining since November and I seem to spend an awful lot of my time these days ankle deep in mud! Although I loathe wet, gloomy weather, I love the fact that it gives me the perfect excuse to make soup. I love soup. In any shape or form. In winter, I make and eat a lot of soup. My absolute favourites are potato and watercress which is creamy with a deliciously peppery bite and chicken broth, which is basically happiness in a bowl. It will pretty much cure everything. Ok well that might be a slight exaggeration but it’s pretty close. I also love trying new things. We try and cook at least one new thing each weekend and this weekend, it was, not surprisingly, soup. Puy lentil and spinach soup to be precise. I was looking on the internet for a recipe specifically containing spinach. Mostly because we seem to have a bit of a glut of it going on in the fridge at the moment. That’s what happens when you let your husband loose in a supermarket unsupervised. He’s brought a bag of spinach home every week for the last 3 weeks. A big bag of the stuff. So, I was on a mission to use some of it up. I came across a recipe by Hugh Fearnley-Whittingstall over on his River Cottage website and decided to give to a go. It only uses up 100g of spinach but hey, it’s a start …. only 3 more tonnes of the stuff to use up! It was absolutely delicious. I used green lentils because I didn’t have any Puy lentils and I also used chicken stock instead of vegetable stock because I haven’t found a vegetable stock that doesn’t contain celery and I hate celery. Served sprinkled with shavings of parmesan cheese and warm, crusty rolls. It was fabulous. Here’s how to make it if you wanted to give it a go. It serves 4, with generous portions. 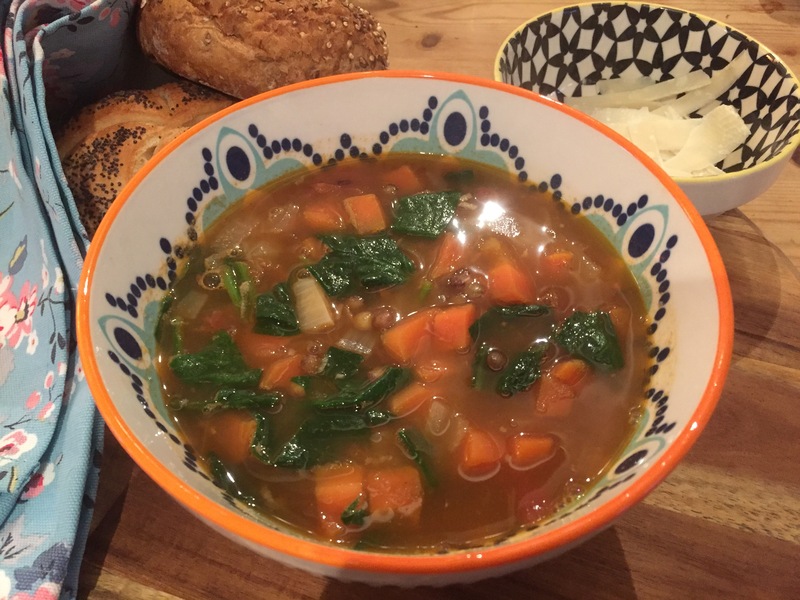 Puy Lentil and Spinach Soup. Heat the oil over a medium-low heat in a large saucepan. Add the shallots or onion, carrot and thyme and sauté gently for 5 minutes. Add the garlic and tomatoes and sauté for a further minute. Tip in the lentils, stir, then add the stock and a little salt and pepper. Bring the soup to the boil, reduce the heat and simmer for about 25 minutes, or until the lentils are tender. Add the parsley and spinach and simmer for a further 5 minutes. Check the seasoning, then spoon into warmed bowls, trickle over a little oil and shave over some cheese, if you like. The Best Chocolate Brownies Ever. I did make the lentil soup. Very good. I usually order lentil soup when dining out and generally like it but the recipes I have tried just haven’t done it for me. So I’m glad to have one now that[ both my husband and I like.